Viking Books for Young Readers, 9780670062973, 48pp. 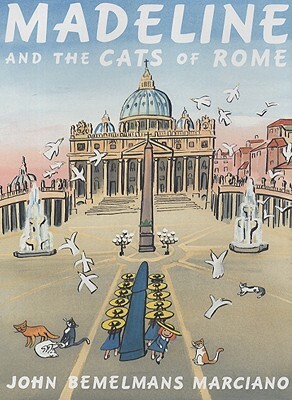 The Paris skies are gray, so Miss Clavel and the twelve little girls are leaving for brighter weather---spring in Rome. Rome has wonderful sights to see and delicious things to eat, but Madeline also finds an unexpected adventure, involving a thief, a chase, and many, many cats. The first all-new Madeline book in close to fifty years combines a lively story with luminous gouache and watercolor illustrations. Beloved Madeline returns, as brave and irrepressible as ever! John Bemelmans Marciano carries on the legacy begun by his grandfather, Ludwig Bemelmans, author and illustrator of the Madeline books, with stunning watercolor artwork and playful, energetic storytelling. John Bemelmans Marciano is the author and illustrator of several other books including Delilah and Bemelmans: The Life and Art of Madeline’s Creator. He lives in Brooklyn, New York.